The Metropolitan Opera house is often only a quarter full, and, at that, many seats are deeply discounted. As the curtain rose on Act II of Beethovenn's Fidelio, you remember why this house was built. The cell in which Florestan is held prisoner is deep underground. Sea level is way up at the top of the Met's 100 foot high stage. The prisoner is hard to detect in bluish-black lighting of Duane Schuler against light of a similar hue in the back of his cell. Sir David McVicar is one of the few directors today who makes use of the stage's grand dimensions to create grand opera. It may be that grand opera is not the goal of the present administration, focused as it is on HD broadcasts. 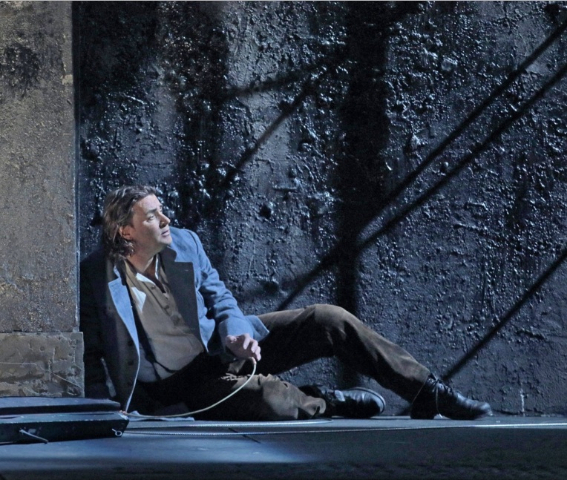 The sets for Fidelio were created in 2000, preceding the current Met regime. Karita Mattila sang the lead role that year. She is in a class with Kristen Flagstad and Brigit Nielssen, her predecessors in the role. So too is Elza Van Den Heever who performed the role at Caramoor last summer. She was not present on the Met stage for this Fidelio. Like Gerald Finlay in this season's William Tell, Falk Struckman and Klaus Florian Vogt were out there trying to keep the whole together as one opera. The rest of the cast were adequate, their adequacy in part measured by marvelous performances such as Hannah-Elisabeth Muller as Marzelline, the goaler's daughter. Not only is her voice lilting and lovely, but she is a superb actress, at attention and reacting at every moment. When that deep cell wall opens out into the bright light of day and releases Lenore and Florestan, free at last, the audience chortles. It is a lovely, surprising moment. In General Manager Peter Gelb's favor, opera fans who only experience the Met in HD still think it's terrific. Discussing sopranos difficult to listen to live, HD observers find them distinctive and talented. One opera singer suggests this is because you can hear them in HD. If the Met's future is in HD, it is doubtful they can afford the quarter-filled house they now use as a launching pad. If the current eleven-member executive committee with deep pockets continue to write big checks, the Met Opera may survive for a while. Jeanette Lerman-Neubauer has been interested in high tech like the HD transmission since she was a corporate public relations officer at Time-Warner in the 1990s. Ambassador Nicholas Taubman inherited his father's auto parts business and sold it for a fortune. He has a museum which features Gilbert Stuart's paintings in Roanoke, Virginia and was a highly successful Ambassador to Romania in the George W. Bush administration. (Mrs. Gelb has conducted often in that country). Taubman is bright enough to have learned about opera. Gelb has obviously handled him well. Yet it is offensive in this time of challenged arts funding that a company which fought with its twenty-two unions was given a million dollars by the Manhattan Borough President and uses Public Broadcasting to advertise a poorly-received production of the Ring Cycle. That documentary, subsidized by Gelb, did give us one piece of useful information. The Met management insisted that the set be shipped before it was completed. This led to dangerous conditions for singers on an inspired creation by Robert LePage. Stephanie Blythe as Fricka insisted on being strapped into her throne. Deborah Voight fell. The stage may continue to be dangerous for singers for other reasons. At the opening of the Met fifty years ago, the roundtable did not work for Samuel Barber's Anthony and Cleopatra. Incoming music director, Yannick Nezet-Seguin, will remind us of the problems created for Leontyne Price that evening as he conducts the opera's overture at an anniversary gala in May. So far there are no signs that the Met is going to change it ways to address in-house attendance issues.